Mr Mega Casino offers a special VIP program - check the details on the website. Live dealer games (Auto Roulette, Baccarat Squeeze, Blackjack VIP). 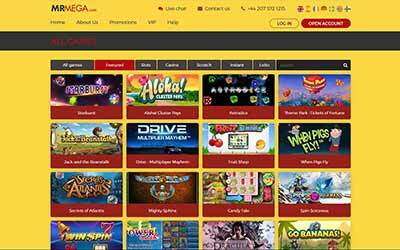 Mr Mega Casino provides a rather extensive FAQ section, the link can be found at the bottom of the starting page. The support team can be reached via email and live chat, but keep in mind that the agents are not available at any time. They work every day, from 06:00 to 23:00 GMT. After you are done with the registration process, you can claim their welcome offer. You don’t have to look for Mr Mega Casino bonus code - just deposit at least €10, and that’s it. The first deposit will bring you a 100% bonus up to €200 and 20 spins. Then, if you deposit at least €20 on the second day, you will get 40 more Mr Mega Casino free spins. On the third day you can repeat this trick. Both bonus amount and winnings from the spins must be wagered 35 times, which is not that bad. This means that if your bonus is €50, you will have to bet at least €1,750 (50x35). Otherwise, you won’t be able to cash your winnings out. Yes, Mr Mega Casino welcome bonus looks attractive, but there is something you should know about - not all the games contribute to the wagering requirements in the same way. Some of them contribute only 50% or even 0%. Check the bonus conditions to discover all the details. The casino offers enough deposit methods: Visa, Sofort, Skrill, Euteller, Zimpler, Paysafecard, and others. All deposits (except those which are done via wire transfer) are processed instantly. The list of withdrawal options is shorter, but there are still plenty of methods to choose from: wire transfer, Skrill, Neteller, Trustly, Visa, Mastercard, and so on. Mr Mega Casino withdrawal time depends on the chosen method. For example, withdrawals via Skrill take 3 business days.